For a long time in Tanzania, politics has been dominated by the figures and personalities who have been around since the anti-colonial struggles of the 1960s and later the ideological upheavals of the Cold War era. But for the past few years, a crop of young politicians have been breaking through in ways that promises to forever transform our political culture. Unencumbered by the dogmas and ideological entrenchments of the past, they bring a fresh perspective on the big challenges confronting our country in this new century. One of the young men to have emerged from this fog of the past is Mr. January Makamba, the Chief Speechwriter and Aide to President Jakaya Kikwete. Born in 1974, Mr. Makamba never imagined himself pursuing a political career. As a young student he aspired to be a doctor or perhaps engage in a career in business. This all changed during a gap year before university when he spent time in Kigoma, in the northwest of Tanzania. The year was 1994 and the Rwandan genocide was at its most murderous phase, forcing a huge influx of refugees into Tanzania. While in Kigoma, January got a job in the refugee camps, first as a Registration Clerk and later as an Assistant Camp Manager for the second biggest camp in Kigoma, known to its residents as Mtibila II. Witnessing the extraordinary daily suffering of human beings in the camps left an indelible mark on the young January, and from then on he made a promise to himself that he will dedicate his life to public service, to ensure that such untold suffering never happens again. With that in mind, January attended St. John’s University, a small catholic school in America’s Midwest in Minnesota majoring in Peace and Conflict Studies. After graduating in 2000, he became a Fellow at the Carter Center, a human rights institute founded by former U.S. President Jimmy Carter, out of Atlanta, Georgia. As part of the fellowship, he spent time in Sierra Leon, an experience that deepened his desire to understand the nature of war and the pursuit of peace. After completing his Fellowship, he enrolled for a Master of Science degree in Conflict Analysis and Resolution at George Mason University outside of Washington DC. After graduating in 2004, January returned to Tanzania and joined the Ministry of Foreign Affairs, where he became an aide to then Foreign Minister Jakaya Kikwete and worked closely with him in the regional peace negotiations that Tanzania was involved in at the time. After the latter ran for president in 2005, January joined him on the campaign trail, traveling with the candidate to every district in the country. The experience made January realize that perhaps public service was his calling and when candidate Jakaya Kikwete was elected President, January joined him at State House as one of his senior aides and chief speechwriter. He recently took the time to sit with me and have a chat about politics, public service, the future of Tanzania and why he finally took the plunge and decided to run for parliament. Qn: First of all, what exactly do you do? My primary work at State House is to help the President to organize his thoughts on a piece of paper. Some call it speechwriting …but the President really writes his own speeches. But there is a need for someone who knows how he thinks, that has an intellectual partnership with him, so that he presumptuously can put something on a piece of paper… something that the President would say. Because I was there since day one when he was running for President, I know how he thinks and his ideas on almost everything. So, I think that’s how I acquired the job not necessarily through any skills in writing I might have. Also, as Personal Assistant to the President, you do many…things that he asks you to do which are not really properly defined. It’s just that you have to be given a title. But I do a range of activities, sometimes act as an emissary to different groups and so forth. 72% of the Tanzanian population is under the age of 29. And the median age of Tanzania is 17. So, it is a very young nation…If you look at the demographics structure, you can notice this huge bulge of young people. And this is not without significance and has a massive impact in politics and society in general. And these bulges are transitory and they happen in a certain period in a country’s history and it disappears. Fifty years ago or even thirty, we did not have this bulge. This is a new phenomenon. And twenty or thirty years from now, the structure would be different. So, my view is you have to seize this moment. Young people possess imagination, ambition and drive. And if politics can take advantage of this moment we can actually transform our nation. I think it is critical for political actors to be conscious of this reality and to do something about taking advantage of this reality. The worry, which is quite clear at present, is that these young people can switch off from politics. But the biggest concern for me is if they switch off from civic life which I think is something of a higher purpose than politics itself. Do they volunteer? Will they form debating clubs? Will they have avenues of expression? Will they congregate somewhere to discuss the fate of the nation and its destiny. I think we see less and less of that, which is a worry. Our fathers sometimes forget that young people are inspired by other young people. A form two or form three kid is not going to want to be like CCM Secretary General Mzee Yusuf Makamba but he/she may relate with a much younger politician. That is why it is very important for the young people to get involved more and may be the political system can change to make it easy for them to participate and get elected into political office. Qn: How is it like being a son of a famous politician? First, great respect comes from knowing that your parent has devoted his life to public service. There are many sacrifices which the family has had to accept because of our father’s work. Second, with the name Makamba comes both good and bad. The good is that so many people around the country have worked with my father and respect him greatly. So you have a ready network of extended family, many of whom have known me since I was a child and they are happy to see me doing well and to help with advice or in any other way they can at any time. But also, there are those who disagree with my father politically or have a bad view of him. Often people cannot differentiate between the views of the father and those of the son. So you find that you inherit both the friends and the enemies of your father despite what you may want for yourself. Furthermore, as a child of a politician, people presume that you have lived a privileged life and that you have been spoiled and cannot stand up on your own. This is not true. We have always led a normal life. I recall that my father owned his own house for the first time in his life not so long ago and it was a normal thatched house in Kiomoni Village in Tanga. During the rainy season it would leak. We had to move the furniture and beds out. We used to walk twelve kilometers, around going to school. Our lunch was just some roast cassava and water bought with the fifty shillings our mother gave us. But today, everybody thinks that it was all bread and butter and that we got a lift to school in a car. QN: There is a concern that the political elite is ‘keeping it in the family’ so to speak. Could you talk about that? I think over 95% of those among the so called political elite do not originate from political families. And also I think that 95% of politicians hope that their children do not enter into politics. I also know that majority of young people from political families who have chosen to enter politics have not been pushed by their parents. I know I have not. So, people tend to look at isolated names and then they make these broad conclusions, so I reject that criticism. Also, it is quite insulting because we young people have choices and you cannot tell me that because my father wants me to be like him, therefore he is pushing me against my will. I make my own decisions. And it’s just that I have that original sin, which is possessing his name. But your larger point is still valid, the political system has to be open. My worry is that it’s not that kids with big names are going into politics. My worry is, people with money are buying their way into public office. If money has such a huge influence in politics, the people who are disadvantaged most are young people because they don’t have enough money. Qn. You recently announced that you will run for parliament from your home constituent of Bumbuli. Now, you currently have a decent and influential job as counselor to the President. Why would you want to get yourself into the hustle and machinations of electoral politics? 1. Moving on. Even before this idea of running for parliament came up, I have been contemplating for quite some time and was leaning towards a decision that, after my boss’s re-election in October, I should probably move on and explore other challenges. What is more of a challenge than representing the voices of some of the poorest people in our country? 2. Finding a Voice: You are quite correct that, my current role, while a behind the scenes one, I can influence things quietly. I mean one of the important qualifications for this job is a fierce obsession with anonymity. On the other hand, I have been itching to speak out and participate in public discourse and debates on the issues of the day. I thought perhaps as a Member of Parliament, I can spell out ideas, expose them to challenges, and get them to work on the ground. This, for me, is an attractive prospect. 3. Acting differently. I came into government (and participated in politics) with a firm belief that politics is a vehicle for service. But, to my disappointment, I have discovered that a very tiny minority of political actors care for public service. President Kikwete is an excellent example of a leader who has devoted his live to public service and he is an inspiration for me. I believe, with a public office, by a way of example in the manner with which I will hold it, with complete devotion to service, I can demonstrate a different way of doing things. 4. Showing up. Our nation is at the brink of generational transition - with old actors paving way for new ones. But new actors - the new generation - have to show up. I feel a sense of responsibility to participate in public life, and therefore, by performing well, inspire and recruit good young people into politics. One can only do this through success in public life and exemplary service. Therefore, it is very important that I succeed as a candidate. 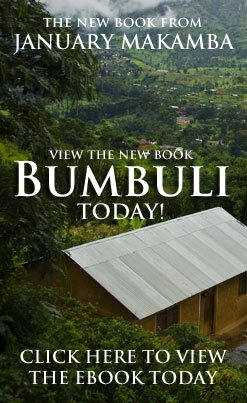 I have some ideas about Bumbuli that I am putting in a book to be published and launched in early July. I would not run for parliament if it did not mean – at least in my mind – something transformational, because it is so easy to be elected to parliament and simply (and comfortably) go through the motions of being an MP. I realise that, sometimes, the expectations that the people have on an MP may not be commensurate with the means that are at his/her disposal. But I also believe that it is possible to expand the possibilities of what an MP can do. For a start, changing the concept of citizenship in the constituency – getting people to see that it is within their ability to change the course of their fortunes, to appreciate the limits of outside “agency” to transform their lives, and to act and live in a manner that recognizes that the existence of a community does not require resources other than the willingness to be honest with voters. Yes, electoral politics can be nasty - everyday lies are told about you particularly in blogs, preposterous conclusions are drawn about you by people who have never met you and so on - but, for me, this is precisely the reason for being involved in politics. You can't change it if you are not in it. Omar Mohammed is a Strategist with Serengeti Advisers, a Consultancy Firm based in Dar es Salam, and a Contributing Editor to the magazine.